A key part of the Developer’s Agreements was the stipulation that the design of the District Center include spaces for public meetings and gatherings, a community plaza. Site plans for the Black property include a plaza on the Northwest corner next to the intersection of Palouse and Regal. Initial concepts from 2011 show a wide open space from the street into the parking lot with some sort of tower in the center. Designs from April 2013 replace the tower with a fountain and shaded trellis to screen the plaza from the intersection. The latest version included in the approved building permits remove the water feature and instead show a raised planter with columnar basalt elements. 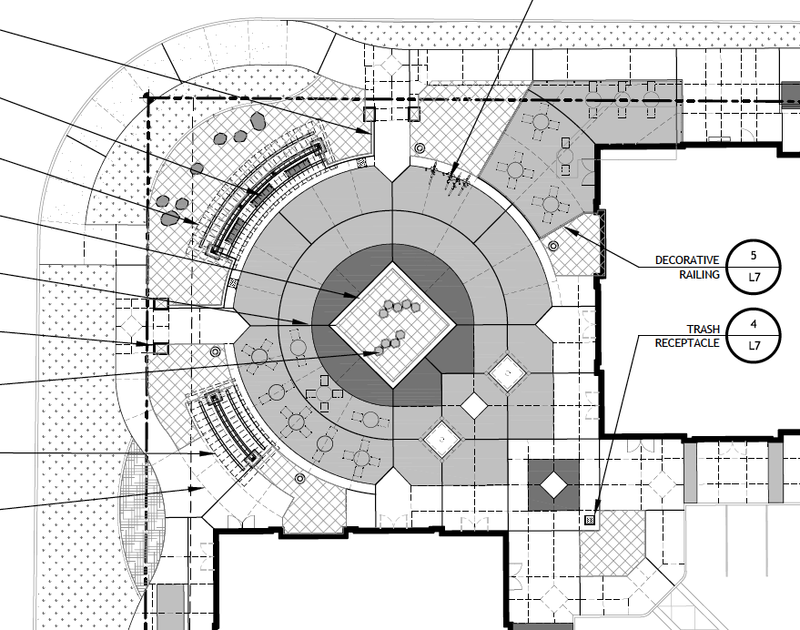 Plaza design from the city-approved building permits. At our last SNC meeting, Dave Black came seeking input on the “sculpture” in the plaza and showed the plan from April 2013 to spur the discussion with meeting attendees. He also introduced us to the artist he is working with on this feature: Robert Sevilla Naudon. If you have ever eaten at Manito Taphouse or Steelhead Grill you’ve seen the result of his work and vision. 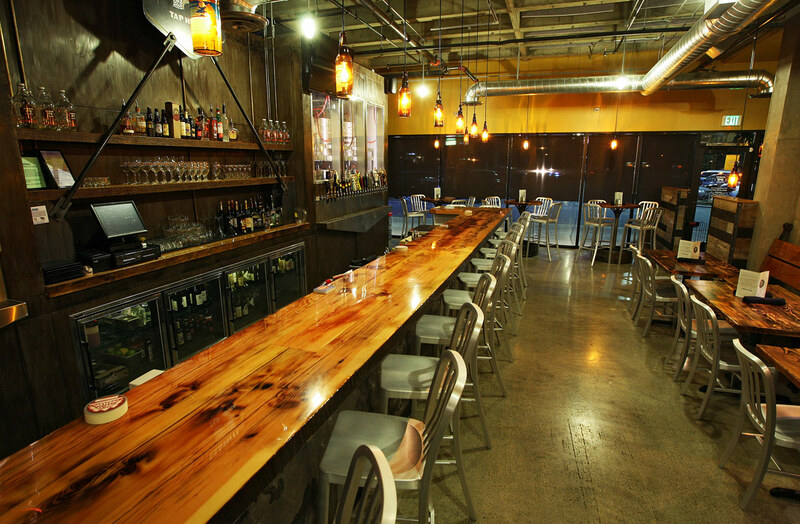 Industrial metal and high-gloss raw wood make for a striking design at Manito Taphouse. Robert gave a very enthusiastic impromptu presentation on his ideas and vision for the project. Quick straw polls of attendees highlighted the neighborhood’s desire for a water feature (almost a unanimous consensus), some ideas of moving the feature from dead-center in the plaza to one side (to make more room for gatherings and events), and incorporation of some Palouse inspired themes (wind, grasses/wheat, and Big Rock/Basalt). 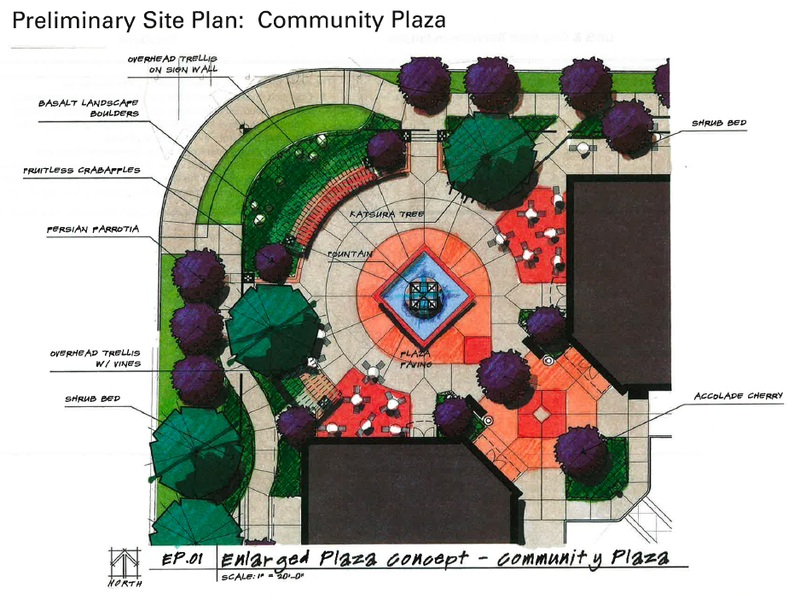 Some elements of the plaza (lighting, benches, bike racks, concrete treatment) will come from the approved District Center Integrated Site Plan. There was also some broader discussion about what kind of programming could be done with the space. Patio/sidewalk dining has been featured in the approved site plans, but neighbors also indicated their desire for music and speaker events and neighborhood fairs (craft/art, farmer markets, etc.). Dave and Robert will take that into consideration to make sure to include things like accessible power for PA systems and vendor booths. Dave and Robert said they would take the input and work on some concepts. SNC looks forward to seeing those results and we will share them as soon as we hear back. What do you think of the plaza so far? The past two months we’ve had discussions at our neighborhood council meetings about continued struggles getting the city to enforce the Spokane Municipal Code and Developer’s Agreements in the design of the Southgate District Center. At issue right now is the 18 month battle to hold substantive discussions about the Right-of-Way (ROW) designs in the developing District Center. In January we drafted a summary of 5 major issues related to the ROW designs in the District Center and delivered it to all the members of the City Council and the City Planning Director. Last night the Southgate Neighborhood Council passed a resolution outlining the issues and their proposed steps to resolve them. Major issues related to the ROW design include required features like on-street parking (SMC 17H.010.120(A)), something Southgate has been pushing for and asking to be addressed since August 2012. Additionally there is the issue of designing the street character to align with the requirements of the Integrated Site Plan, Spokane Comprehensive Plan, and the Southgate Neighborhood Transportation and Connectivity Plan. These include complete street features pedestrian crossings, speed limits, medians, and other traffic calming features (lane widths, street trees, bike lanes, etc.). Many of these ideas are touted as Best Practices in the recently released Link Spokane brochure. When completed, the Southgate District Center should end up resembling Perry Street or Garland Avenue. The zoning and stipulations of the Developer’s Agreements fundamentally change the character of what Regal Street and Palouse Highway should be. This area could be Kendall Yards South instead it’s heading toward looking like East Sprague or North Division. Please take a moment to read our issue summary and resolution and then contact our elected leaders (District 2 Councilmen Jon Snyder and Mike Allen, Council President Ben Stuckart, and Mayor David Condon) and remind them of their commitment to creating a pedestrian oriented, mixed-use District Center in Southgate. Mayor Condon is trying to brand Spokane as the “City of Choice”, right now the Planning Department is choosing to only enforce portions of the municipal code and binding Developer’s Agreements. I sure hope that was not the kind of choice the mayor was talking about. The New York Times reported yesterday that about the same time Southgate’s big box Target will open in July, Target Corporation will be opening their smallest store to date: a 20,000 square foot neighborhood size store called “Target Express” in Minneapolis. This news reinforces the slow demise of large format retail as companies like Target and WalMart test smaller scale stores that will fit in pedestrian scaled, walkable neighborhoods desired by more and more people nationwide. You’ll recall Target started this downsizing trend in their company a couple of years ago with the opening of a few City Targets in places like Seattle and Portland. This trend is coming too late for the development of the Target in our neighborhood, but can hopefully be realized as the other two Southgate District Center properties are designed and built. People aren’t looking for big box retail centers anymore, they want walkable neighborhoods with right-size amenities nearby. People are choosing well-designed, walkable neighborhoods over suburban sprawl. The sooner Spokane realizes this, the quicker we can become the “City of Choice” envisioned by the mayor. Last month we found out that the city has granted permits for all the buildings on the Target site. We showed the plans at the Southgate Neighborhood Council Meeting last night, but I’ve uploaded them here so you can see them in detail. THey have not changed much from the first versions we saw during the Design Review process back in February an April last year. One new addition is the identity of the tenant of the largest business site in Pad D: PetSmart. As you can see their name is on the 12,000 square foot site and that was confirmed in conversations with city Planning Department staff.